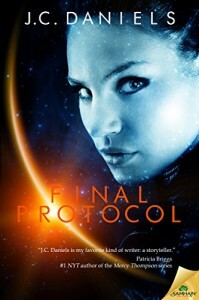 Final Protocol is an extremely short read and I hope the beginning to a new series by Ms Daniels (aka Shiloh Walker) so I'm not following my usual format. Since this is such a short story, it's hard to get a lot of details but we do get a feeling for the main character, Silence. She's an assassin and isn't quite sure how it all happened. She has vague memories of being a completely different person but can't exactly remember everything. She does know she "belongs" to a beautiful monster in lieu of a debt. Yep, she was traded to her owner over someone else's debt. Her owner wants someone dead so badly he makes a deal. Silence does the kill and she's free forever. The question is, can Silence trust the deal or should she just try to run?? A Sci-Fi mystery with a touch of romance. Final Protocol is a good opening short story and the ending is somewhat resolved but it's open to continue if Ms Daniels and her publisher decide to go forward.